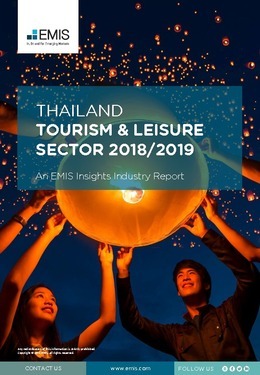 Thailand tourism & leisure sector plays a significant role in the national economy. According to World Travel & Tourism Council (WTTC), the sector made a direct contribution of THB 1.4tn to the economy in 2017, and the number increases to THB 3.2tn if wider contributions are taken into account, which represent 9.3% and 20.9% of the total GDP of THB 15.5tn, respectively. Thus, the sector receives considerable attention from the Thai government. The Ministry of Tourism and Sports (MOTS), which oversees the sector, works closely with other ministries and agencies to develop infrastructure, marketing, labour force etc. to drive sustainable growth in the sector. Key subsectors include travel accommodation, MICE (meetings, incentives, conferences and exhibition) tourism, and medical tourism. This report provides a complete and detailed analysis of the tourism sector for Thailand. EMIS Insights presents in-depth business intelligence in a standard format across countries and regions, providing a balanced mix between analysis and data.